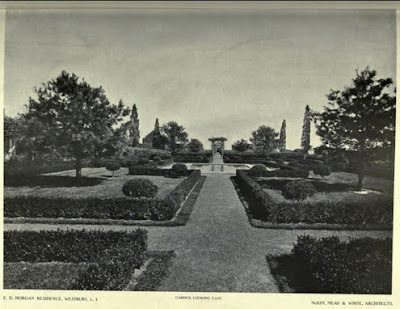 'Wheatly', the Edwin D. Morgan III estate designed by McKim, Mead & White between 1890-1900 in what was then Wheatly (now Old Westbury). Click HERE to see the brochure from when 'Wheatly' was for sale and HERE to see 'Wheatly' as it looks today. 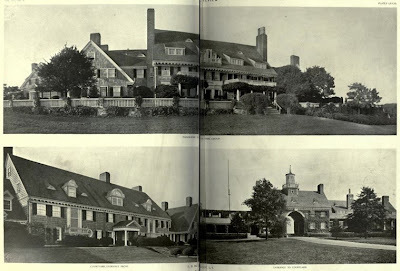 Pictures from Architectural Record, 1907.
one of my favorite estates on this site for many of the same reasons that idle hour is (see my comments i added today under idle hour). One reason is i really really love the little enclosed medieval village feel of this place. also, the landscaping is nice without being overpowering. 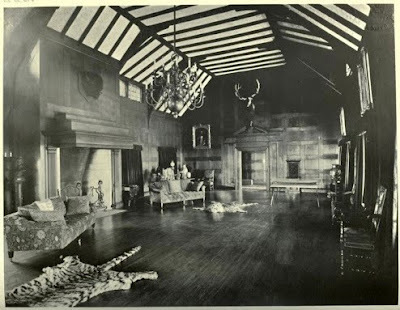 a third reason is, like idle hour, the completeness of the many structures on the estate. 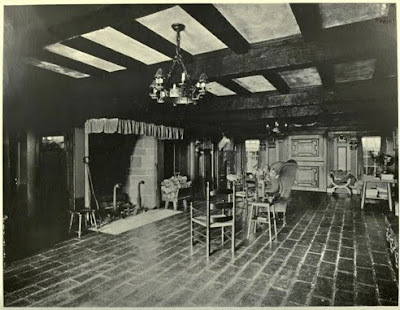 this (and idle hour) were places built to take care of themselves. if i lived here, i wouldn't want to have to have the help keep running into town to get things. on these complete and pleasant estates, they didn't have to. everything was available on site. like idle hour, belmont towers, laurelton hall, this is one of the more quirky - i've got the money -let's spend it - types of places. my faves. i like the stotesburies places and everything mizner ever did. There is a great story somewhere on the 'Lost Village of Wheatly'. It talks about how there used to be this very tiny little enclave between Old Westbury and Brookville called Wheatly from a term the Natives had used. ED Morgan and WC Whitney wound up buying the vast majority of the little village when they built their estates. The current configuration of Post Road as it is with it's S curve as it ascends the hill is that way because the original Post Road ran right through what became Morgan's estate. He and Whitney paid to have the road moved between their estates and had it planted (which is why it is one of the nicer stretches of road through Old Westbury). I think current day Morgan Drive is roughly the route the original Post Road would have taken you. and one enclosed medieval village. 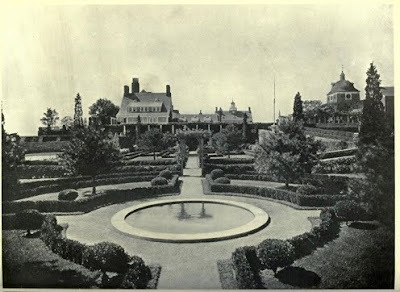 This place had such a dream like quality....Love the effect it has---Long Island vernacular colonial blown up and supersized, wonderful relationship to its site, and a dream like quality to some of the vistas. It must have been astounding. As for Idle Hour, My fellow Mainer Turner hasn't convinced me. It has its moments, but unlike some of the masterpieces the Hunts, pere et fils created for the Vanderbilts, as a work of architecture, it has an uneasy relationship with the very ground it sits on---it might as well be in Manhattan, unlike the Breakers or Marble house, where windows open out onto terraces and balconies forming a platform that mediates between house and ground. 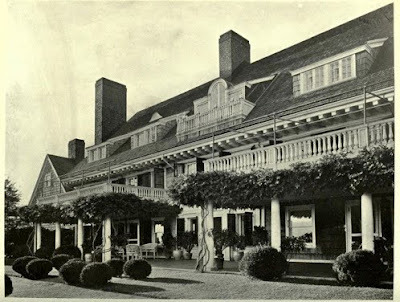 Wheatley is the clear precursor to those highly civilized, large, yet intimate Country houses that were done so well on Long Island through the 20's. I am most fascinated abt. Lost Wheatley village and the old post Rd. Those trees you mention always enchanted me as a child. Growing up there as a kid and playing in those very woods and meadows I always had a sense of people and civilization even before the Gold Coast era. I am curious if you know of any relation between what I knew then as the Lebeouf estate and "Wheatley"? The Lebeouf property was just past the S curve heading to B'ville at the top of the hill and before the int. of Whitney lane. The property/house would appear a maisonette in comparison to Wheatley. But it's old and stately and would appear to be sitting on what would have been the original Wheatley property line. Randall J. LeBoeuf Jr. is the author of 'The Lost Village of Wheatly'. He knew Mrs. E.D. Morgan and she is quoted in the writing. LeBoeuf does make reference to his home but it is not the one I linked to. 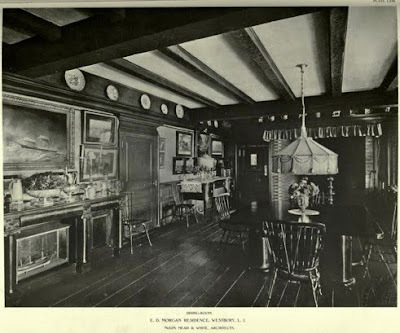 His was built c. 1740 and known as Sycamore Farm and says it eventually became the residence of one of Morgan's sons. I believe it was a superintendent's house before that. I have a copy of the 'The Lost Village of Wheatly' but I wouldn't want to reproduce it on here without LeBoeuf's permission. I'll have to try and find out if he is still living (the story is 38 years old). Send me an email. 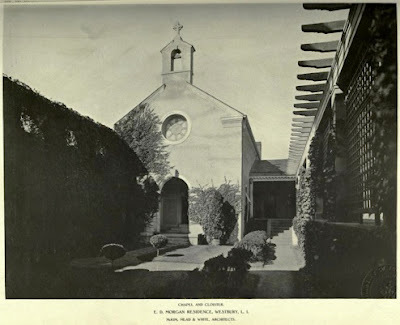 The photograph of the chapel is ravishing. Beautiful photograph and beautiful situation. I'm always jealous of anyone with a private chapel. This has a lot of neo-colonial charm and the scale is impressive. T.P.R. - I often agree with your comments but just can't say that Idle Hour moves me much. Did you see the link Zach provided yesterday for Sunken Orchard? That is a beautiful and understated house but also is a fully contained estate with some spectcular gardens. Does that appeal to you at all? Just curious. Thanks all. sunken is nice because of the vast number of buildings - can's say the house moves me much. thanx to half pudding for the mizners esp linden hills. what a place!!! Dear Anonymous...my grandfather was born on the E.D. Morgan Estate, in 1894, along with his 2 sisters & 3 brothers. My great grandmother died there in 1901, as did my great grandfather in 1904. Does any of this seem familiar to you ? This is all I know about their lives at the E.D. 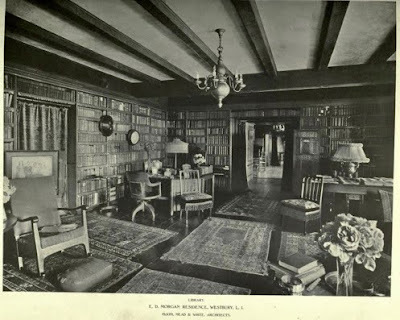 Morgan Estate.